You can save even more when you combine a clearance item with a rebate APP. 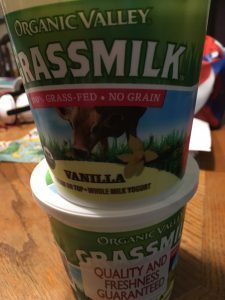 In this case, the Organic Valley Grassmilk vanilla yogurt was close to date and had $1.50 reduced stickers on them. By checking the coupon data base while at Jewel, I saw that Ibotta had a 85¢ rebate (limit 5) so into the cart they went as I added the offer to my account. There’s also a $1 bonus offer for buying 2 of the Grassmilk products, but don’t think I’ll get it for buying multiples of the same item 🙁 But paying $2.64 a carton works for me!